Wednesday, March 20, Emmaus/Emaús Lutheran Church, 1925 Summit Avenue, will host the last of the Wednesday fellowship and worship services of the FaithWorks Racine Lenten pilgrimage. Between 5:00 and 6:00 p.m. tour guides will be available to welcome people and to give tours of the building, including the second floor murals created by David Holmes. At 6:00 p.m., everyone is invited to Fellowship Hall for a full meal. During this time, there will be an opportunity to watch a short video about the ministries of Emmaus/Emaús. At 7:00 p.m. there will be a procession, beginning at the circle drive at the south entrance to the building. The crowd will shout “Hosanna” and wave palms, as they greet Jesus and a live donkey making their entry into Jerusalem. The crowd then enters the sanctuary to a changed mood. 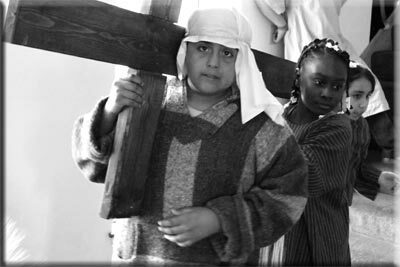 The time which precedes Jesus’ death is reenacted by the children of Emmaus/Emaús, with the story being told through mime and narration. At the end, all are invited to the haunting experience of entering the tomb—a time for prayer and reflection. Note: Due to predicted cold weather, the route of Jesus and the donkey will be shortened from the previously announced route, and will not include a lap around the field.